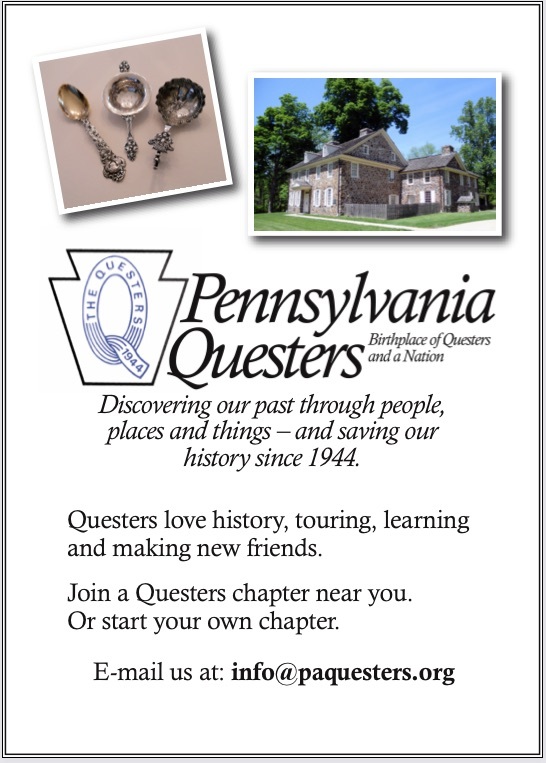 Pennsylvania Questers is a Chartered State member of Questers International (questers1944.org). Some information from Questers International, below, explains a little about us. The Questers preserve and restore things from the past for the benefit of the future. We love history, educating ourselves and others, and collecting. Our shared knowledge and experiences with like-minded individuals often promote lifelong friendships. A Quester member belongs to a Chapter that has monthly meetings and programs which educate, stimulate and captivate interest through trips, speakers and workshops. Chapters may hold joint meetings to socialize and share programs. At the State level, there are yearly meetings which include educational opportunities as well as meeting fellow Questers. As a Quester, there are often opportunities to go behind the scenes at Museums and Historic sites. Many Quester chapters are also involved in local Preservation and Restoration (P & R) projects in their own communities. Chapters may apply for an International or State Grant to support these projects. They also do local fundraising for the projects. All donations made to The Questers are tax-deductible. Guests are welcome at all activities.